Chemical weapons reportedly used by NATO-armed, funded terrorists near Damascus. December 24, 2012 (LD) - PressTV has reported (more details via Fars News) that chemical weapons have been used by militants fighting Syrian government forces in Daraya, near Damascus. PressTV also reported that threats have been made against Syria's ethnic minorities that their water supplies will be poisoned by militants - this on the heels of the UN itself warning of (and preemptively spinning) impending sectarian-driven genocide. 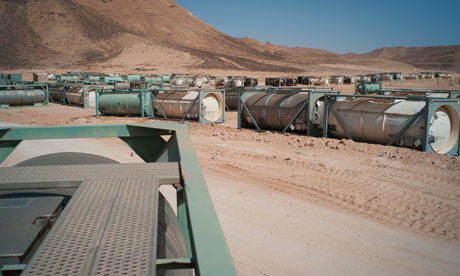 Image: (via the Guardian) "Chemical containers in the Libyan desert. There are concerns unguarded weapons could fall into the hands of Islamist militants. Photograph: David Sperry/AP" As increasing evidence reveals Libyan fighters and weapons are pouring into Syria, the West has been preparing to cover up the inevitability that Libya's chemical arsenal will also found its way into the besieged nation. It now appears that such weapons are being deployed by NATO's terrorist proxies. The world's largest Muslim body on Sunday condemned threats made by Islamist rebels in Syria against two Christian towns, warning of fresh confessional strife in the war-torn country. The use of chemical weapons, if confirmed, will indicate a desperate new dimension to NATO's proxy war with Syria - one meant solely to sow fear and terror, as well as sectarian strife, where the Western axis has otherwise failed both tactically and strategically. With NATO-backed terrorists openly threatening sectarian genocide, there are fears that not only NATO, Saudi, and Qatari weapons and funds will be used to carry it out, but a large arsenal of weapons brought with Al Qaeda terrorists from Libya, including its large cache of chemical weapons. The Western media, and Western government officials have been preparing the public for the imminent use of chemical weapons in the Syrian conflict, trying to pin responsibility on the Syrian government, regardless of which side actually uses them. As early as 2007, the US, Saudi, and Israeli government had been preparing to unleash armed, sectarian extremists tied directly to Al Qaeda, with the intent on waging a region-wide sectarian war to destroy Lebanon, Syria, and Iran. Despite US and Lebanese officials warning of the "cataclysmic conflict" the West and its regional allies were planning, the plot was put into full effect come 2011. As sectarian genocide unfolds, the Western media, in tandem with Western officials, feign ignorance and shock at the conflict they themselves purposefully engineered over the last several years.